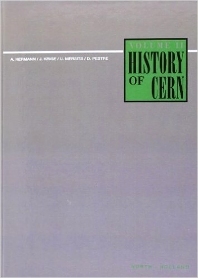 The first volume of the History of CERN (published in 1987) dealt with the launching of the European Organization for Nuclear Research covering the period 1949 to 1954. Volume II continues the history through to the mid-1960's, when it was decided to equip the laboratory with a second generation of accelerators and a new Director-General was nominated. It covers the building and the running of the laboratory during these dozen years, it studies the construction and exploitation of the 600 MeV Synchro-cyclotron and the 28 GeV Proton Synchrotron, it considers the setting up of the material and organizational infrastructure which made this possible, and it covers the reigns of four Director-Generals, Felix Bloch, Cornelis Bakker, John Adams and Victor Weisskopf. Three considerations are relevant to the treatment of the material in this volume. Firstly the political dimension, in the broad sense of the term, was no longer omnipresent as during the process of creation. Alongside it scientific and technical determinations were at work. The second consideration is that the institutional dimension was also inescapably present. Finally, there was no longer one dominant process in the organisation's life but several and it was no longer possible to tell just one story. The authors therefore decided to focus attention on various aspects of CERN's life. Part I attempts to describe the various aspects which together constitute the history of CERN and aims to offer a synchronic panorama year by year account of CERN's many activities. Part II deals primarily with technological achievements and scientific results and it includes the most technical chapters in the volume, chapters using as main sources publications in the open literature, internal reports, and minutes of specialized committees or of divisional meetings. Part III aims to define how the CERN system'' functioned, how this science-based organization worked, how it chose, planned and concretely realized its experimental programme on the shop-floor and how it identified the equipment it would need in the long term and organized its relations with the outside world, notably the political world. The concluding Part IV aims to bring out the specificity of CERN, to identify the ways in which it differed from other big science laboratories in the 1950's and 1960's, and to try to understand where its uniqueness and originality lay. Preface. Remarks on the notes and bibliographies. List of archival sources consulted. List of abbreviations. Part I. An Overview of the First Decade of CERN. 1. 1955-59. Building the laboratory (J. Krige). 2. 1960-65. Running the laboratory (D. Pestre). Part II. Physics and Engineering at CERN. 3. Some aspects of the history of high energy physics 1952-1966 (A. Hermann). 4. The 600 MeV synchro-cyclotron (U. Mersits). 5. The construction of the 28 GeV Proton Synchrotron and the first six years of its scientific exploitation (U. Mersits). 6. The construction of CERN's first hydrogen bubble chambers (L. Weiss). Collection of Documents and Photographs of Historic Interest. Part III. Planning and Managing Research at CERN. 7. The CERN system. Appendix. The European Study Group on Fusion'', 1958-64 (D. Pestre). 8. The organization of experimental work around the Proton Synchrotron 1960-65 (D. Pestre). 9. Planning the infrastructure for the Proton Synchrotron experimental programme (J. Krige). 10. The debates in the Finance Committee and the Council over the level of the budget (J. Krige). 11. The contract policy with industry (J. Krige). 12. The second generation of accelerators for CERN: the decision-making process (D. Pestre). Bibliography for parts III and IV. Part IV. Concluding Remarks. 13. Some characteristic features of CERN in the 50's and 60's (D. Pestre). Appendices - 1. Organigrammes of CERN: CERN divisions and their leaders. 2. Director-Generals and Members of the Directorate. 3. Member States and their Contributions to the CERN basic programme. 4. Senior Office Bearers in the Council and its Committees. 5. Members of the SPC, up to 1965. 6. V. Weiskopf's table of some important research results obtained at CERN or elsewhere in Europe in connection with CERN within the period 1960-1965. Who's who in the history of CERN (A. Hermann). Chronology of events (J. Krige and D. Pestre). Index.